(Nanowerk News) The construction of model quantum systems or simulators that can reveal hidden insights into other, less accessible quantum states requires paying attention to interactions normally overlooked by most theories, finds a RIKEN-led study ("Microscopic Model Calculations for the Magnetization Process of Layered Triangular-Lattice Quantum Antiferromagnets"). The research team has uncovered evidence of a weak force in a quantum simulator prototype that can answer questions about phase transitions involving Heisenberg's uncertainty principle and supersolids — matter with both superfluid and crystalline order that behaves like a viscosity-free liquid. One promising quantum simulator is a class of insulating crystals known as triangular-lattice antiferromagnets (TLAFs). These compounds feature sheets of magnetic atoms, each containing single unpaired spin states, bonded into perfect triangular lattices. The triangular geometry prevents the magnetic spins from finding their most energetically stable state, resulting in a ‘frustrated’ system that makes TLAFs superb probes of phase transitions brought on by quantum fluctuations. The newly found cobalt-based material Ba3CoSb2O9 appears to hold the most promise among TLAFs because it forms a nearly perfect triangular crystal with relatively simple magnetic interactions. Recent experimental measurements of Ba3CoSb2O9 single crystals, however, have revealed a peculiar magnetization anomaly: a sign of extra quantum spin states under high magnetic field that should not exist, according to most theories. Giacomo Marmorini and Ippei Danshita from RIKEN with Daisuke Yamamoto from Waseda University set out to solve this problem through ‘microscopic model’ theoretical calculations. This approach divides the TLAF lattice into multi-atom, triangular clusters that have the same equilibrium properties. 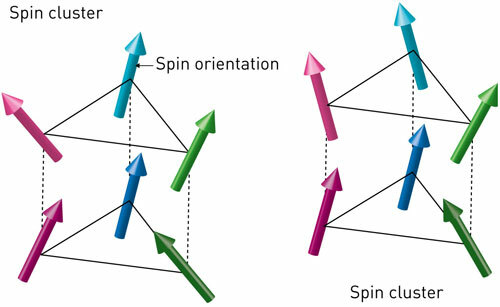 By scaling from a minimal three-atom cluster to a near-infinite TLAF sheet, the team calculated how quantum effects emerged under different conditions of interacting spins. To make their model more realistic, they also included three-dimensional interactions between adjacent Ba3CoSb2O9 sheets.